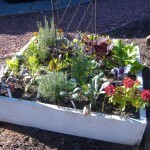 Square foot gardening is an easy, efficient way to grow vegetables, herbs, and even flowers in a small amount of space. With square foot gardening you create beds above ground level that maximize space while reducing the effort required to prepare the soil, maintain the garden, and harvest your vegetables. Square Foot gardening was introduced by Mel Bartholomew in 1981, and has since been practiced worldwide. Mel’s website, squarefootgardening.com has more information than you’ll ever want to know on this subject. Getting started with Square Foot Gardening? Choose a sunny location with at least seven hours of direct sunlight daily. Avoid low areas that may puddle after a hard rain. Make access convenient for watering and harvesting. Build 4’ square boxes (length can be longer, but for access avoid wider than 4’). Boxes should be 6-8” deep. Use untreated wood 1”x8” lumber in 4’ or 8’ lengths (building supply store will cut lumber for you with no charge). Use deck screws or nails to hold corners together. If you build more than 1 box, separate them by at least 3 foot so you have room to work. If you have built your boxes over grass, you may want to line the bottom with newspaper or weed barrier before filling with soil. You may have your own aged compost to use or try 1/3 topsoil, 1/3 mushroom compost, 1/3 hen manure (mix thoroughly). Dividing your box into 12 inch squares is the key to making this so easy to manage. One 4’x4’ box makes 16 sqaures. You can use a strong wax coated string, thin wood strips, or a coated wire. Use nails or screws to attach the dividers to the sides of the box. 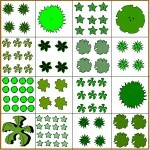 Select a different vegetable, herb, or flower for each of the squares. You will plant, 1, 4, 9, or 16 seeds or starter plants per each square. Follow any instructions on your seed packets for spacing. For example: 3 inch spacing means you can use 9 seed per square. 6 inch spacing allows you to plant 4 seeds per 12” square. If the packets suggests 12” spacing, plant just one seed per square. Save your seeds, as you can have several crops in one season. Using your finger punch a hole in the soil to the recommended depth on the seed packet. Plant just one seed per hole, and lightly cover the seed with soil (do not pack the soil down). By following the recommended spacing and just using 1 seed per hole, you eliminate having to thin you crop in the future. There is no set rule for watering. The soil needs to be kept moist while the seeds germinate, so you will be watering frequently at first. You don’t want soggy soil, just moist. Keep in mind, hot weather, or windy days will dry the soil faster than mild or over cast days. When watering, avoid heavy direct sprays. Use a watering wand or water by hand. As you harvest a square, you can immediately replant. Keep some extra soil on hand to fill the box again if need be.